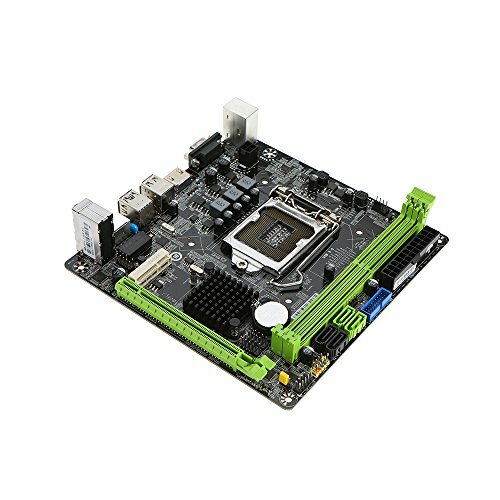 KKmoon MAXSUN MS-H81IL M.2 for Intel H81 LGA 1150 Socket Desktop Computer Mainboard Motherboard SATA 6Gb/s USB 2.0 Games DDR3 Intel LGA1150 Mini-ITX by KKmoon at Pacs BG. MPN: JIF7410978164063BD. Hurry! Limited time offer. Offer valid only while supplies last. MAXSUN MS-H81IL M.2 motherboard support for Intel LGA 1150 socket processor(TDP:95W) and dual channel DDR3 memory as equipped with 2 memory slots. MAXSUN MS-H81IL M.2 motherboard support for Intel LGA 1150 socket processor(TDP:95W) and dual channel DDR3 memory as equipped with 2 memory slots. Based for Intel H81 chipset, delivers the great performance enchantment to system and ultimate scalability hardware expending. Perfect for gamers, enthusiasts, seasoned or new builders. Based on for Intel H81 chipset and fully support for Intel LGA 1150 series socket processors, such as for Intel Core i7 / i5 / i3, for Pentium, for Celeron processors. 2 * DIMM slots, support dual channel DDR3 1066 / 1333 / 1600MHz Non-ECC memory. SATA 3.0 6Gb/s increasing the data transfer rate between the motherboard and internal storage devices and USB 2.0 480Mb/s speeding up the data transfer rate. Full solid capacitors provide a more stable power supply even under high temperatures ensure a longer service life and boost the ultimate performance. Short circuit protection, ESD protection--protect your motherboard from electrostatic damage, LAN surge protection--protect against LAN surges and lightning strikes, TVS diode protection--protect against current or voltage surge.